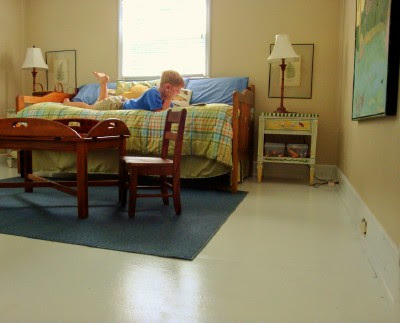 Here are photos of the painted floor in my son's bedroom. July/August is a good time to look for inexpensive rugs. Walmart, Target, etc. roll out bound carpets for college kids. Case study: to what degree will Lego bricks abrade a painted floor? I love both rooms. Beautiful, but still perfect for playing and reading. I never realized how light filled a room could look by just painting the floor white. Meridith, I must sat that you have an absolutely delightful and whimsically decorated house. I love the children's rooms. I totally want to paint my floors white and my walls yummy colors now....er, that is if i didn't rent and if my landlord hadn't installed new laminate flooring before we moved in. I love the look of a painted floor, I always have. I tried to convince my dad to paint our floors white in high school when we moved into a 106 year old house with the original, scarred hardwood floors. He being a mechanic who works outside under cars all day didn't see the necessity or practicality of painting brown floors white. or to put it more simply~ I love the makeover. I love the floors. I have seriously considered doing the same in our bedrooms as the carpet is BAD and I know there is some ugly hardwood under there. I'm trying to figure out if there's a way to have this look...but I have concrete floors. Even upstairs! Any ideas? Andrew's room looks great. Being able to see the little toys and sweep them right up will be much easier with little John crawling around! I'm really surprised at how spacious the rooms look with painted floors - I never would've guessed it would make such a difference. I'm thinking painted floors will be perfect for our downstairs (if we ever get that far!). both bedrooms look incredible! we painted our kitchen subfloor as a temporary solution. color choice is key, as is good quality paint. yours both look/sound fabulous! Oh, Meredith! I LOVE the floors in those rooms!!! You have inspired me!! Thank you! Oh Meredith, how beautiful! You really do have a gift. Both rooms look just amazing. I love them! When you originally asked for suggestions about the floor, I was a 'Paint the whole thing' voter. Looks like you agreed and the results are wonderful. My husband now looks at the pictures on your blog because he too finds your frugal home improvements inspiring! I love it just as much as the first room. Your floors and your childrens' rooms look awesome! It shows off the space, the light, and allows the warmth of your beautiful furnishings to shine through. LOVE IT. What a great room for a growing boy. I love how you've had the furniture grow with Andrew and added pieces to reflect new stages--the coffee table looks wonderful for protecting legos from swiping little hands. My 5 yo has a daybed and 2 yo has trundle (it's very low since rolls instead of pops up & we use it pushed against the adjacent wall to keep it still) and I recently started using the space under the daybed for legos in a underbed plastic box--not as efficient as deep bins but easy to spread out tiny little lego pieces. Love the painted floors. They look clean and crisp. Your house looks great too. Both of your childrens rooms are just darling. I also love the yellow kitchen. My sister Beth has a yellow kitchen very similar to your color and it has always been such a bright spot. I love it!!! It makes me wish we didn't have hardwood floors!!! I would so do that! I just realized that there are no chests or dressers in either room. Where do you store folded clothes like pajamas, underwear, t-shirts, shorts, socks, etc? Are the chests in the closets? I love the spacious look but can't imagine no toys about or drawers for folded items. I would love to hear your solution for storing clothes. Girl, I just love your ideas. Hubby is going to die when I tell him that I want to tear up the carpet..lol. I may wait a few years till a few more kiddos come along. I just love your blog. Thank you and keep up the good work. think that would work on cement floors? I am loving your home updates! Both of my kiddos rooms are in need of help, but our 1980's house has nothing nice under the stained carpet. I'm still finding wonderful ideas from you on bedroom furniture! I can't remember, how do you store your children's clothes? That is our biggest issue right now. We only have 1 dresser and it isn't in good shape. My daughter was using dorm room style cubes, but they keep falling apart. And I'll need to store the boys' clothes too once they come... actually I should start sorting and storing now. The paint job is wonderful! Great job!! The rooms look great! I love painted floors, although I have no experience with how they hold up to wear and tear, but I would think they should do well. I'm sure you have a practical reason, but why does John share Elise's room rather than Andrew's? 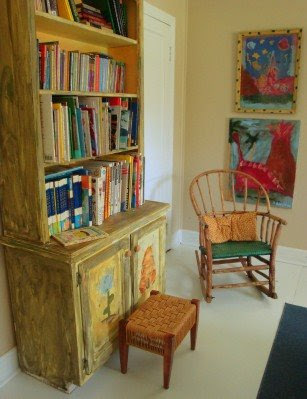 I noticed, too, that the rocker that was once in the "nursery" is now in John's room. Is that where you rock the little one to sleep? There is absolutely nothing that I love more than rocking babies! I sometimes travel for five hours just to rock my two year old granddaughter and put her to bed. In fact, I did that Saturday, and drove back 5 hours on Sunday, and it was worth all the time and money! Oh, boy, do you have the wheels turning in my decor-impoverished head. I have no knack for these things, but your photos make me think, "Hm...maybe..." I'm thinking it could solve our family room dilemma. The carpet is probably 30 years old, and I've dreamed of hardwood for the past 8 years, but the carpet remains. Maybe I could roll on some porch paint and buy time?? You manage your family SO well; you inspire me. Two questions: 1) what is the best way to keep up white floors? (I'm considering porch paint colors for my recently enclosed sunroom w/ concrete floors.) 2) when does shopping for a bargain become a disadvantage? My hubby mentioned that his mom always bought the same brands of everything, which made me wonder if my bargain shopping is worth all the work. I'd love to hear your advice b/c we homeschool and live on one income w/ 3 kids also. I love all of your budget decorating tips, but painting the floors is such an awesome idea! Beautiful floors! I painted my sons' bedroom floor white a few years ago, but I used cheaper paint and now it's in sad, sad shape. I want to paint them again, and this time I'll get some better paint. I really love the look of painted floors. I LOVE the floors. You've decorated your kids' rooms so beautifully. I feel so inspired. And I think the coffee table in Andrew's room is brilliant for Legos. I'm going to keep my eyes open for one like it. You did a wonderful job on the floors! I would love to try that, but I am afraid to even start. The rooms look awesome! Your floors look beautiful. I love the tidbit that caring for them with a new coat of paint is no more work than mopping them. But I'd be nuts with thinking that my kids would be putting black marks and scuffs and scrapes in the paint. Or maybe a few coats of poly kind of protective thing? Forgot to add that I love how you have put a picture up at preschooler height. I've done the same thing with a picture in Parker's kitchen area. The rooms are lovely!! So much better. It looks so fresh and new. I love the white floors. They look bright and cheery. Lovely! Your sons room is lovely. Bright and airy. Perfect for a little boy. The flors are wonderful. Why did I never think of that? My son took his legos to college and has them in his apartment as a twenty something. some things they never outgrow! Your house always looks so gorgeous. I'd want to live there! Meredith - you have done a splendid job with the floors! are you allowing shooz on the floors - socks only? Did you cover it with a top coat to prevent knicks and scrapes? guess who's back and full of southern belle charm and unbelievable southern neccessities packed down in all of her suitcases? I was blabbing all about your blog down south to my relatives at the family reunion and several have already chimed in and are too chicken to write something! They talk about you on my facebook. Oh Meredith, they turned out great and wow with the painting! I love to paint -- I don't love to prep, but I love to paint. How did you do it with the kids around??? Was this a weekend project? My kitchen is beige and I am thinking of going to a darker tan. Yellow would be very interesting. I'm not sure if I can commit to a yellow, but I love the sunshiney-ness you have gotten. A good friend has a burnt orange kitchen and it is Fabulous. She has a lot of decorating objects that break up the color. Your painted floors look wonderful. What a great idea. I have no carpets anymore and cement floors with vinyl that looks like wood (people always ask if it is real wood) and although I was worried that it would be too hard and cold I haven't seen any big difference, and I don't miss carpets at all. I can't believe how much dust gets under the beds each week and can't imagine how dusty the carpet under the beds must have been. When it is time for new floors (hopefully a long time from now) if the cement is in good condition, I think I will try painted floors. too chicken to act solo - I need help thinking this one through - any advice? I LOVE those painted floors. It's wonderful when necessity dictates such resourceful and fabulous results. I really enjoy your blog and all your clever ideas. Well, it's beautiful. I hope it is also durable. "Case study: to what degree will Lego bricks abrade a painted floor? Hey, so, it's been almost a year, is it time to ask? How has the paint on the floor held up?